One of the fun things about sewing is experimenting with new fabrics! There's a trend for sheer fabrics this fall, for evening blouses or coverups, or just a glamorous scarf. 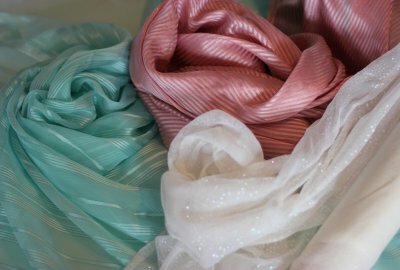 This weekend, pick up one of these French silk chiffons and have a fun time learning how to sew with sheers. These are 65% off while supplies last. Here are a few tips for sewing with sheers: (Scroll down to the middle of the page). Here's a self-drafted pattern idea. Finally, here are the silks we've specially priced for this weekend for your new sewing adventure!